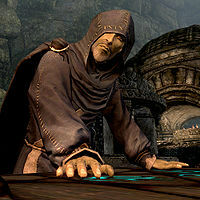 Calcelmo of Markarth, Scholar of Markarth, was an Altmer conjurer of great renown who dedicated himself to researching the Dwemer. He and his nephew Aicantar studied the Dwemer ruins beneath Markarth. He is the author of the series of books known simply as Dwarves. His next expected work is a book on the translation of the Falmer language which is tentatively titled Calcelmo's Guide to the Falmer Tongue. Several translations of Falmer texts are accredited to Calcelmo. While Calcemo was considered eccentric for spending all of his time studying the Dwemer ruins, he did find the time to fall in love with a Redguard woman named Faleen. During 4E 201, Calcelmo found himself in possession of Stendarr's Hammer, although it was soon stolen from him. For more information, see the Skyrim article and the lore article of Calcelmo's Stone. This page was last modified on 21 October 2018, at 07:58.